The first F-35A aircraft directly assigned to the Japan Air Self-Defense Force has landed on Misawa Air Base, Japan. 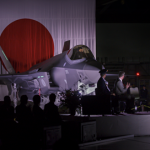 The jet will be assigned to the JASDF’s 3rd wing, and is the second of its kind built at Mitsubishi Heavy Industries‘ Nagoya-based final assembly and check-out facility, Lockheed Martin F-35 said Saturday. The particular unit is one of 42 F-35A aircraft to be designated to JASDF. The first four of which were built at Lockheed’s Fort Worth facility and are currently being used for JASDF pilot training at Luke Air Force Base, Arizona. Officials from the Japanese defense ministry, Lockheed Martin, U.S. Forces Japan and Pacific Air Forces gathered at Misawa to commemorate the first unit’s arrival.